Stella Hill is proud of the home she’s created for herself and her daughter. She’s worked hard to buy the very best of everything … But when she wakes one morning to find her kitchen on fire, Stella knows her life will never be the same again. At least she has Paul to lean on: Paul Smart, owner of Smart Homes, confirmed bachelor and unknowing recipient of a schoolgirl crush Stella never quite got over … When the charismatic John Dean turns up after sixteen years, Stella is determined not to fall for him again. Because now her heart belongs elsewhere. Or does it? With a boss she’s half in love with, a teenage daughter about to go seriously off the rails, a spendaholic mother, and a house to rebuild, Stella’s problems are only just beginning. Laugh-out-loud funny, warm and compelling, this is for readers who love their chick lit with a bit of an edge. Ideal for fans of Fiona Gibson and Carole Matthews. Ever heard the saying, ‘If you can’t stand the heat get out of the kitchen’? I loved the opening. I was immediately drawn in and felt comfortable with Stella’s narration – her character was easy to relate to, funny, down to earth and perfectly believable. There were moments when she got a bit repetitive but it was always in character and never got too much for me to bear. I liked Paul as a character, too. He was Mr Right but with a healthy dose of useless-man syndrome so I didn’t get as irritated with him as I do with the lead romantic interest in some books. My only issue was the complete character reformation he seemed to have in the middle of the book, it would have been fine if it had been slower to form but it all seemed a bit rushed and sudden. One minute he was this guy and then, half a chapter later BAM! he was completely going against what he’d been saying earlier. It eased itself out though, later in the book. Lipsy’s storyline was particularly engaging as it didn’t land too far from home and I liked how realistic it was. Her reactions and feelings were very similar to many I had and made me smile and nod as I read. I sometimes found myself re-reading paragraphs when the point of view changed because I wasn’t sure who was speaking. It was obvious when it was Stella because it was first person, present tense which I loved – The immediacy of it draws you in and you are really connected with her character. But then it would switch either to Paul in third person, past tense, or Lipsy in either first person diary entries or third person, past tense, and I would sometimes get a bit muddled until I was a bit into the section and had established whose head I was in and where. That said, I really enjoyed Lipsy’s diary entries and they often made me chuckle. She was a beautifully articulated example of an annoying stroppy teenager who thinks they know how the world is going to be and then finds everything turned upside down in a series of events they have no or little control over. It’s a place we’ve all been and I think Joanne captured it perfectly. The pacing of the book was good although there were times when I felt a bit bombarded with information and new twists and turns. By the time I was 75% through, I felt a bit bogged down with story-lines and ended up being dissatisfied with several of them because they either fell by the wayside, got glossed over or just didn’t get the detail I wanted because there was no way of exploring everything all in one novel. I think that is where Can’t Live Without fell down for me. There was just too much happening for one novel. None of it was bad, in fact, I enjoy the writing style and loved the main ideas, but I feel it would have been better if Joanne had picked just two or three of her sub-plots and run with them instead of trying to squish everything in. 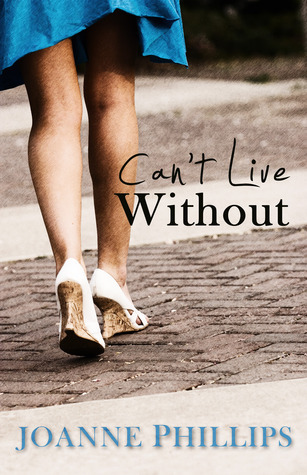 Can’t Live Without is far from a bad book, I did enjoy it, but there were enough niggles that I was left feeling frustrated because I wanted more from it. I felt like I was promised a feast and got given a Deluxe Picnic Hamper – still enjoyable but not quite what I had hoped for. Previous Post Happy Birthday, Daddy!